A small article in 'The Sun' newspaper, 25th May 1967, reported that John Lennon was to take delivery of his newly-painted Rolls-Royce that day. It could not have looked more different, with its sober, black finish being replaced by a new livery of bright yellow decorated overall with Romany-inspired floral motifs. John had taken the car with him to Spain and Germany whilst filming 'How I Won The War' the previous autumn and the journey had taken its toll on the vehicle. In early April 1967, John asked J.P. Fallon Ltd., a coachbuilder in Chertsey, Surrey, about repainting the car. 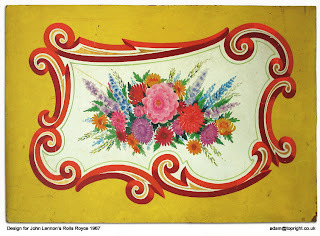 The exact origin behind the distinctive new finish is unclear but it seems that it was Marijke Koger - part of the collective of artists known as The Fool - who suggested to John that it should be repainted in a similar style to the refurbished gypsy caravan that John had had installed in the garden of his Weybridge home. Fallons commissioned local artist Steve Weaver to design and execute the new finish for the car and Weaver's daughter has confirmed that the item offered here is her father's design, as submitted to John for approval. Over several base coats of yellow Weaver applied his concept and it was completed in about six weeks. The car seemed a perfect statement of its time, being unveiled to the public just days before the Beatles' masterpiece recording of 'Sgt. Pepper' was released on 1st June. The car was eventually shipped to the US, where it was used, albeit infrequently, by John and Yoko after their move to New York. In 1977 the couple donated the car to the Cooper-Hewitt Museum and, as part of a fundraising campaign, the Museum auctioned the car in June 1985. The car sold for more than ten times the expected amount, fetching a total of $2,299,000 (£1.7 million), a world record for an item of rock'n'roll memorabilia. Just over a year later it was gifted to the Province of British Columbia and the Royal British Columbia Museum became the custodian of one of the world's most recognisable cars.Background details are sold with this lot, including an issue of the Royal BC Museum's magazine, 'Discovery', February 2006, and copies of Weaver's invoice, 24th May 1967, for work undertaken on the car (£290) and his Application for Registration of Design, 19th June 1967, for the design applied to 'Rolls Royce No. FJB IIIC owned by Mr John Lennon'.